Hungarian scholar; born at Szt. Gál, county of Veszprém, Hungary, July 4, 1849. He was educated at the schools of his native town, and afterward at the universities of Budapest, Vienna, Berlin, Göttingen, and Leipsic, and then went to Paris and London to finish his studies. Bánóczi became in 1878 privat-docent of philosophy at the University of Budapest, in 1879 member of the Hungarian Academy of Sciences, and in 1892 member of the Landesschulrath (royal board of education). Bánóczi has also occupied various positions in the Jewish community. From 1877 to 1893 he was professor at the Budapest Jewish Theological Seminary, and became in 1887 principal of the Budapest normal school for the education of teachers. In 1896 he was secretary of the Hungarian Society for the Promotion of Jewish Literature, and in 1897 member of the Delegation of Hungarian Jews. 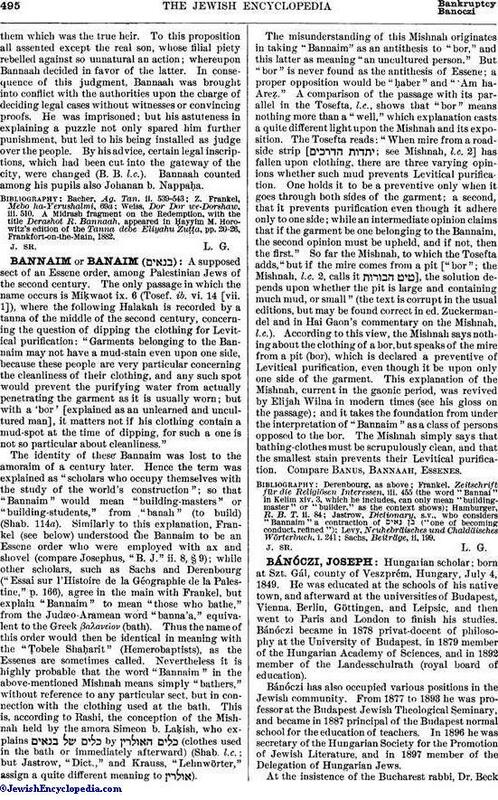 At the insistence of the Bucharest rabbi, Dr. BeckBánóczi, together with Prof. W. Bacher, took the necessary steps to save from certain ruin the congregation and schools of the sect of Sabbatarians in Transylvania who in 1868 became converted to Judaism. Bánóczi has written the following works: (1) "Kant's Lehre von Raum und Zeit" (1875); (2) translation of G. H. Lewes' "History of Philosophy" into Hungarian, 3 vols., 1876-78; (3) "Révai Miklós Elete és Munkái," crowned by the Hungarian Royal Academy of Sciences in 1879; (4) "Magyar Romanticismus"; (5) translation of some of Schopenhauer's works into Hungarian, 1882; 2d ed., 1892; (6) "Emlékbeszéd Greguss Agostról," 1889; (7) translation of Kant's "Kritik der Reinen Vernunft" into Hungarian jointly with Professor Alexander, 1891; (8) translation of Burckhard's "Cultur der Renaissance in Italien" into Hungarian, 2 vols., 1895-96. Bánóczi, together with Professor Alexander, edits the "Filozofiai Jrók Tára"; he has also edited Erdélyi's philosophical writings (1885), and the works of Kisfaludy Károly, 6 vols., 1893. 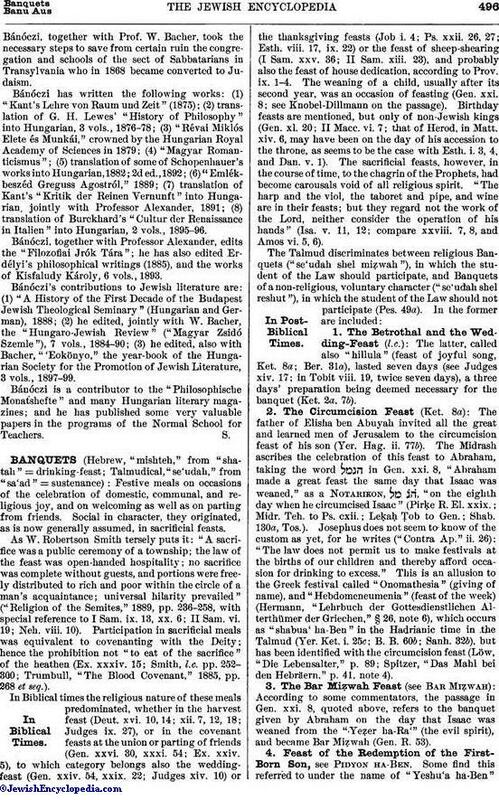 Bánóczi's contributions to Jewish literature are: (1) "A History of the First Decade of the Budapest Jewish Theological Seminary" (Hungarian and German), 1888; (2) he edited, jointly with W. Bacher, the "Hungaro-Jewish Review" ("Magyar Zsidó Szemle"), 7 vols., 1884-90; (3) he edited, also with Bacher, "'Eokönyo," the year-book of the Hungarian Society for the Promotion of Jewish Literature, 3 vols., 1897-99. Bánóczi is a contributor to the "Philosophische Monatshefte" and many Hungarian literary magazines; and he has published some very valuable papers in the programs of the Normal School for Teachers.